Looking for an octa core phone at affordable price? You can check out Cherry Mobile’s latest Android smartphone operated with Kitkat 4.4 OS. Here’s what makes you more excited on this device aside from the specs, Cubix Cube sells below 5000 pesos so it’s a big yes. And guys it has 5-inch IPS HD screen resolution to another plus as most of us prefer wider screen that usual 4-incher phone. To help you know more about this device, just check out the specifications below. Cherry Mobile Cubix Cube price is based on Lazada online sale. Watch out for this item at their website. 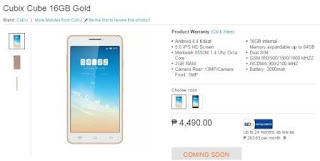 It’s available in color Gold and Black, you can also pay via BDO installments with up to 24 months. Is cherry mobile cubix cube USB OTG?? ?